The airport area, to a land planner, probably seems like a blank canvas labeled “Raw Land.” But there’s stuff going on here. 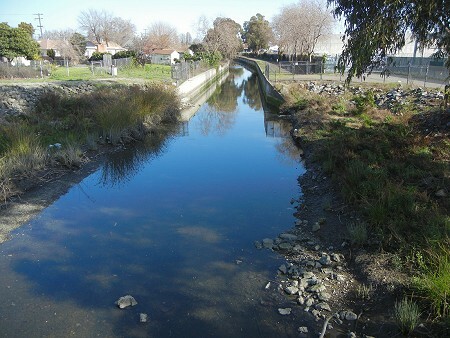 This is where the low end of San Leandro Creek, between Hegenberger and the Nimitz, goes through some significant transitions. Here’s the Google Maps view, followed by the geologic map. 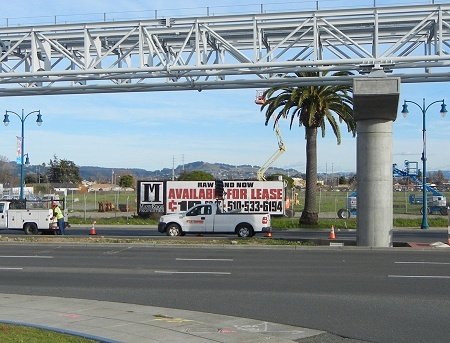 The photo above is from the corner of Leet Drive at Hegenberger. The pink area is artificial fill. 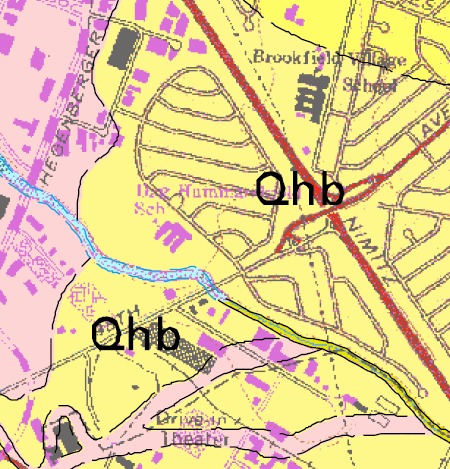 “Qhb” stands for young basin deposits, which is the zone of sediment at the very bottom of the San Leandro alluvial fan just before you hit bay mud. The darker yellow bit at the top is a belt of levee deposits, where the creek once flowed perhaps thousands of years ago. The alluvial fan has a half-dozen of these splaying out from Lake Chabot, from Elmhurst Creek on the north down to southern San Leandro. Looking south (upstream) from Hegenberger, the creek appears almost natural, with its floodplain close-hemmed by levees. At least, it has mud on the bottom and vegetation growing in it. This stretch of the creek is fenced off and inaccessible. From 98th Avenuemore precisely, looking downstream from behind the Wendy’s at the head of Bigge Streetit looks even more bucolic. Between these two points is the original Bay shoreline, a gentle transition from low grassland to high marsh that is almost totally gone from the Bay today. This part of the creek is the nearest it gets to being natural. Upstream from 98th the entire creek is walled in. 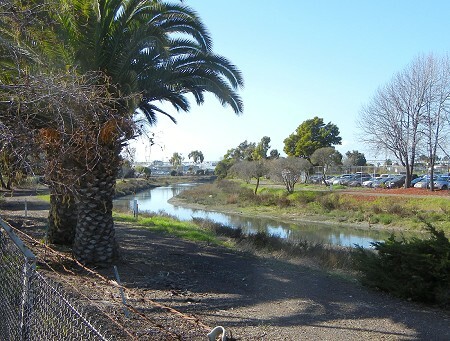 This last shot is from the spot where the power line crosses the creek; as usual the land beneath is an informal public park. A hole in the fence gives access to the creek, but the going looks tough, and besides the dogs here are numerous and excitable. 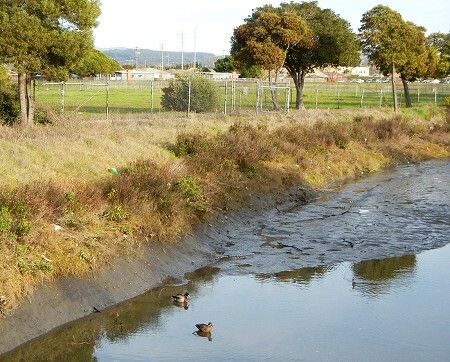 The creek forms the boundary between San Leandro and Oakland from here to the railroad tracks. 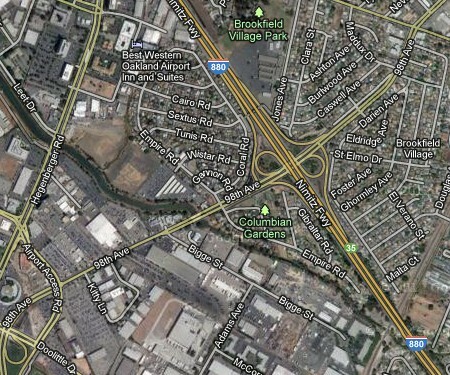 From the tracks to 580, San Leandro spills well north of the creek because, like the village of Temescal, the city began as a town right on the creek. 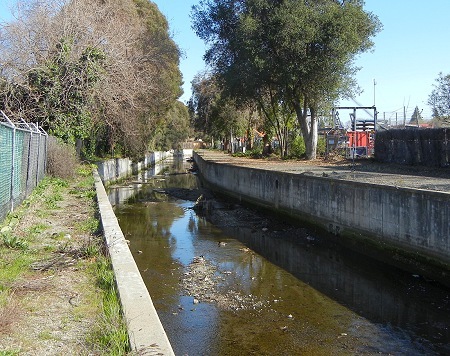 This entry was posted on 16 April 2013 at 2:00 pm and is filed under Oakland streams and water. You can follow any responses to this entry through the RSS 2.0 feed. You can skip to the end and leave a response. Pinging is currently not allowed. There’s nothing real on Google about Dag Hammarskjold school, even though it’s “new” on that topo base map (it’s in purple).